There was a time when stamp collection was the Best known hobby. I did try to collect ‘deo’ cans, but storage-constrains (!) and apathy towards using them a lot to have empty cans, led it to the well-waited death (though I still have a few old days Old Spice and Denim deo cans ;). Guitar was the next hobby, I learnt relatively good and was able to play a few numbers as well to inspire at least one guy to took it as hobby, before I left it. I learnt in very early days of my Guitar-saadhna, that my sura-aptitude is as good as Farhaan Akhtar, and at few notes better (!) than him. Finally, I took riding as one hobby, it made me to motivate towards writing – so blogging as the next one and finally photography as another. This post is about the hobby called Photography, mostly candid (as would be writing a critical later ;)). Rather, this post is about the highly enthusiastic guys I have been in constant touch with, for last few months, for a single reason ‘Photography’. These guys are officially my colleagues and share the same hobby, and thus thought to make a small club (society) to nurture our small ‘amateur’ dreams, learn and share the experiences and finally to grow on the path of the art! True Pixers is our Club, just a few months old and with just a few members who come from a common background of Geosciences, work in same office-premises, love to exhibit their Nikon and Canon DSLRs in addition to Galaxies, Nokias, Desires and a Defy (yeah, that Defy is for me) and a number of another P&S ones as their weapons. Not just to exhibit our Cameras and photographs, our aim is also to share the knowledge (whatever little we know). As I said, we are just a few months old, but are bunch of highly enthusiastic people (rather ‘know-it-all’ bong people (pun intended) and few bhaiyaas). So, despite of our age, we are exhibiting our photographs at NBBA Durga Puja Ground, Opp MGM Hospital in Navi Mumbai. 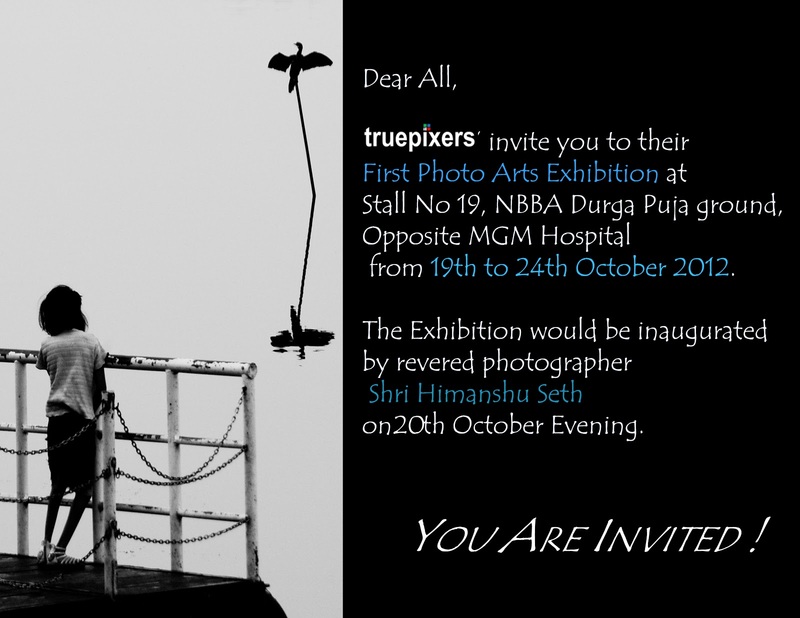 Well known photographer Shri Himanshu Seth would be inaugurating our Exhibition on 20th October 2012 evening. I can promise you a series of awesome breath-taking photographs as well as bunch of guys eager to listen to your honest comments and suggestions. You may show your love at our official website http://truepixers.com and Like facebook identity at https://www.facebook.com/TruePixers.